Virtually every bride will carry some sort of bouquet down the aisle at her wedding ceremony. Typical wedding bouquets are made from fresh cut flowers, but there are certainly some wonderful alternatives. 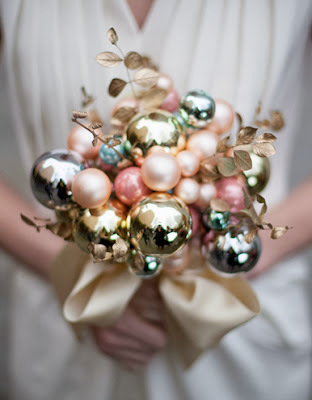 These are fantastic ideas for handcrafted non-floral wedding bouquets. Why opt for a non-floral bouquet for your wedding? There can be many good reasons. For most brides, it is simply the desire to carry something completely unique, which will add style and character to her wedding. We are not talking about fake silk flowers which are designed to replicate the look of fresh blossoms, but rather arrangements which are utterly distinctive and have a great deal of charm. They may be made using floral motifs, or can be something else altogether. 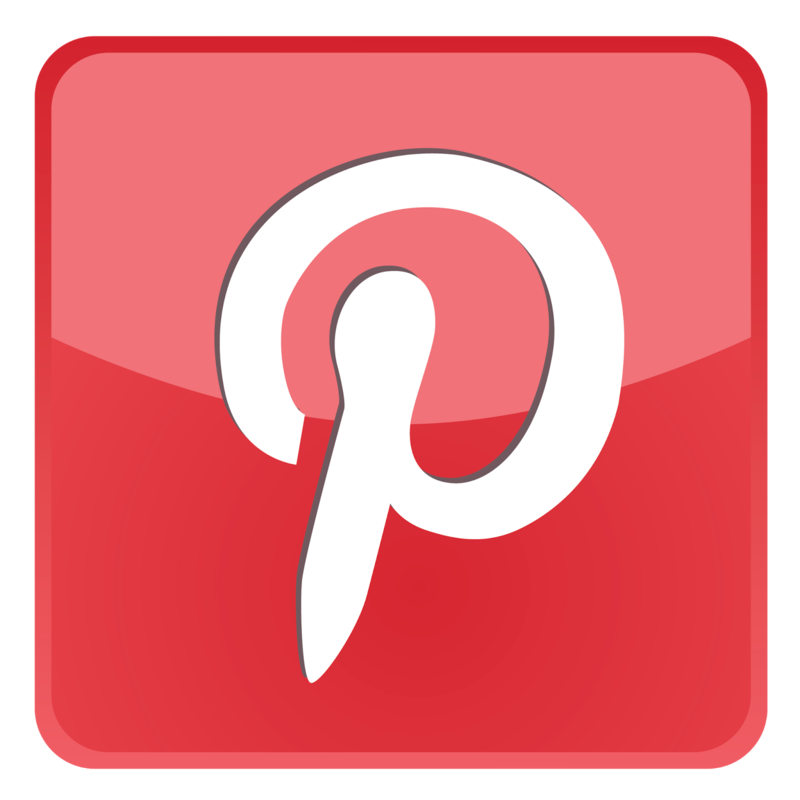 Good places to find handcrafted bouquets include local artisans, craft shows, and online sites like etsy. Brides with a creative side can also make their own unique bouquets with instructions from sites like Martha Stewart Weddings. 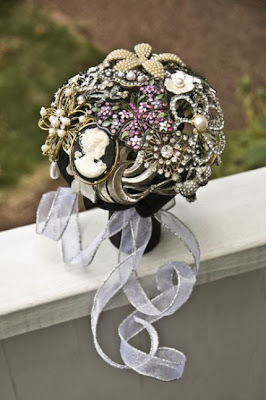 One of the most eye-catching non-floral bouquet ideas is one which is created entirely from vintage brooches. The brooches can be in the shapes of blossoms or can go in a different direction. The most beautiful old pins will feature colorful rhinestones or crystals, pearls, or enamel. It can be fun when the brooches are a mixture of bright colors, or opt for a more understated effect, created entirely from pins such as cameos. 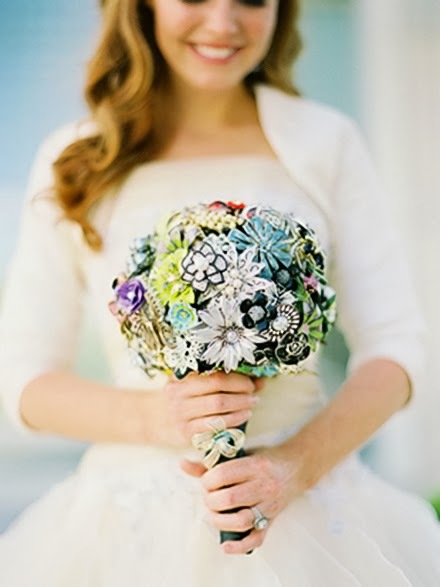 Be sure to select a handcrafted bejeweled bouquet which coordinates with the style of your bridal jewelry. If your bridal jewelry is very traditional, a brooch bouquet with softer tones would be a good companion; if you have selected bridal jewelry which is handcrafted with lots of sparkling crystals, opt for a collection of brooches with plenty of pizazz. Very crafty bouquets are one of the up-and-coming wedding trends. For an arrangement with an abundance of homespun charm, nothing beats felt and button bouquets. They are generally made with colorful felt in the shapes of flowers and leaves, often with embroidery. Then oversized buttons are used to make the center of the "flowers", and the elements are assembled into a classic nosegay shape. 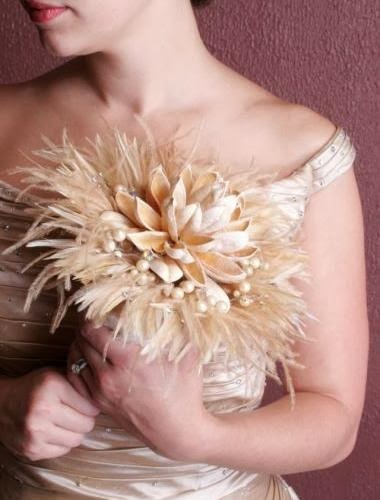 One thing that is wonderful about a felt bouquet is that it can be made in any color your heart desires. The incredible cozy charm of this type of nosegay will make it one of your favorite wedding mementos for years to come. Another neat idea for a non-floral bouquet is to carry an arrangement which is created entirely from faux butterflies. The butterfly is a popular motif right now, and a large nosegay of colorful silk, feather, or paper butterflies is simply delightful for a wedding. For added fun, have a few of your faux butterflies perched on the reception centerpieces as well. There are numerous additional options for unique bouquets made without fresh flowers. You can make your own tissue pom poms or blossoms, create a dramatic arrangement entirely out of feathers, or pay homage to autumn with an arm bouquet made of dried wheat and preserved oak leaves. Whichever you select, you can be sure that your non-floral bouquets will make your wedding memorable and special.